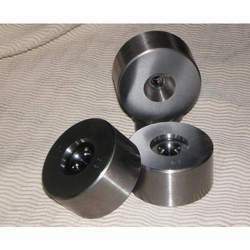 These Wire Drawing Dies are widely used in various industrial applications. 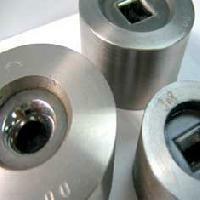 In order to manufacture these dies, we use latest technology and optimum quality raw material. 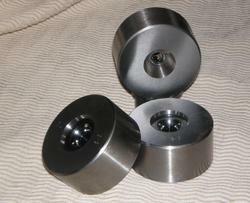 Our T.C Dies give very good production approximately one Tonne or more for 0.76MM. Good surface finish of Copper. Wire Drawing Die very good production approximately one Tonne or more for 0.76MM. Good surface finish of Copper. We make highly designated Carbide Wire Drawing Dies especially designed for wire drawing industries. Our dies are used for M.S, S.S wire, Brass, copper and aluminum wire drawing. Beside the common uses our dies are also applicable in the design of MIG wires and Co2 wires. The wire drawing dies are made by using high quality raw materials that are sourced from known vendors. All the vendors are linked with us over a long period of time. We bother in effective and timely delivery of product once ordered by our customers. we are leading supplier of Wire Drawing Dies..
We make Carbide Wire Drawing Dies . The production arena is focusing on the raw materials and the safety limits. High quality raw materials are ensuring the work efficiency of our wire drawing dies. Fundamentally this kind is using in the wire design and manufacture industries but it includes some other areas also. Carbide Wire Drawing Dies High quality raw materials are ensuring the work efficiency of our wire drawing dies. Looking for Wire Drawing Dies ?